Classic Look “Mini Ham Can” Air Cleaner. Published by Cyril Huze December 20th, 2016	in Customs, Editorial and Engines. This new “Mini Ham Can” is inspired by the MoCo classic air cleaner, but in a small size to look proportionate on naked/chopped bikes. Machined in-house at the LC Fabrications shop in Grottoes, VA, then hand rubbed to a brilliant shine. 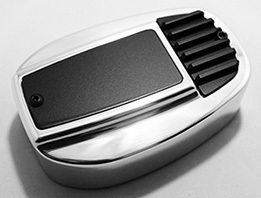 Inserts are given a durable semi gloss black powdercoat finish. 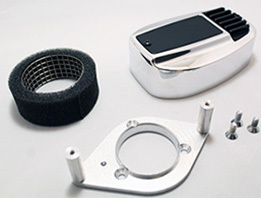 Air cleaner body is approx. 4 x 6 x 2″. Filter is made by UNI Filter and measures 2 1/2” diameter X 1 1/2” wide. 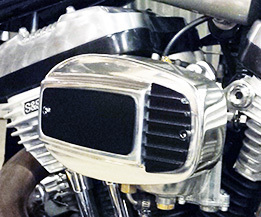 Models are available for S&S E/G carbs, as well as your stock CV Carb. (an aftermarket Carb support is required) $ $275.00. Order at LC Fabrications. Wow. I never liked the ham can, but in miniature, it kinda works. Looks pretty cool, but with the small size you would probably choke off the breathing potential of the motor. I always kinda liked the Ham Can filter and this part is a great interpretation of that. It’s missing the Hormel decal, canned ham was always bad and still is. Icky. I think they should put that little removable key on the side that you use to open the can! Looking back do you think the siamese exhaust was bad? I have never experienced one, but would guess that they run better than staggered duals. Unless the baffling was too restrictive. HUh ? I thought you experts would be all over the filter element. Any How Merry Christmas to All ! i sold my originals 20 years later for good money to restorers. as to the two into one. they were good with an aftermarket slip on turnout muffler.